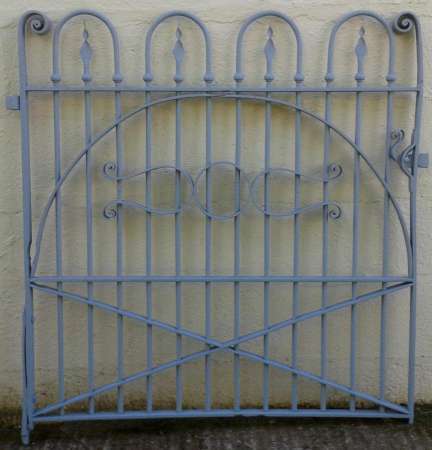 Small antique wrought iron garden gate. 1092mm in height x 740mm in width inc. hinges. 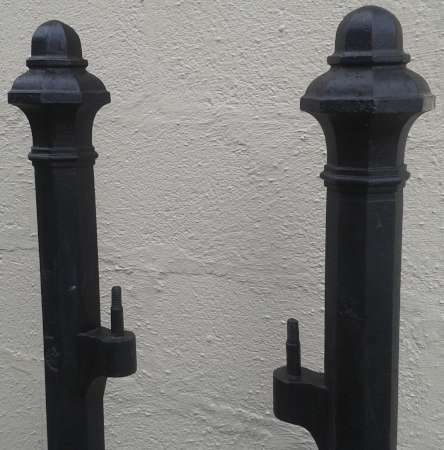 A pair of Victorian cast iron pedestrian gate posts ( repaired at base). Square section 80mm diameter at base x 85mm. Top of hinge 380mm down from top of post. 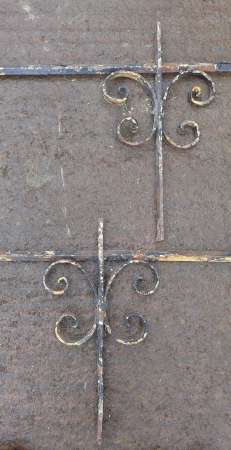 2 matching lengths of reclaimed wrought iron railing. 995mm max.height x 2070mm in length. 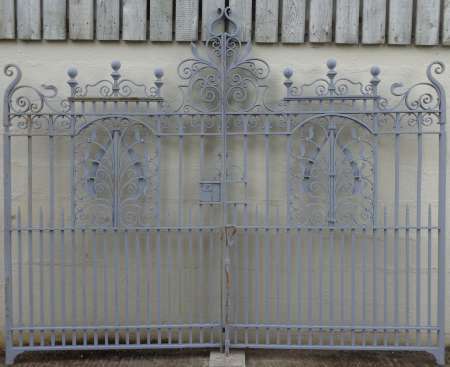 2 matching 19th century wrought iron “estate” gates. 1320mm max. height x 1130mm max width including hinges. 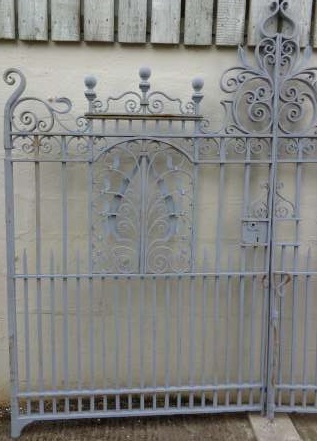 Antique wrought iron garden gate. 940mm wide not inc. hinges x 1300mm max. height. 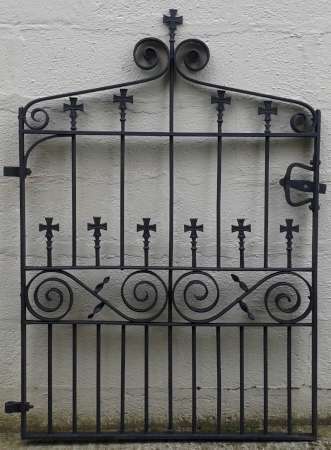 Victorian wrought iron pedestrian gate. 43 1/2″ high x 35″ wide not inc. hinges . 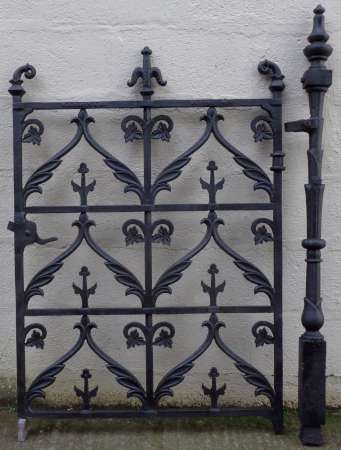 Victorian wrought iron garden gate. 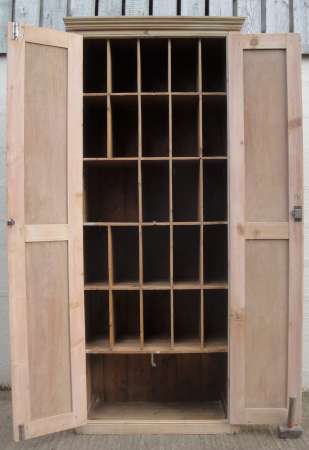 28 1/4″ wide (not including hinges & catch) x 42″ high. 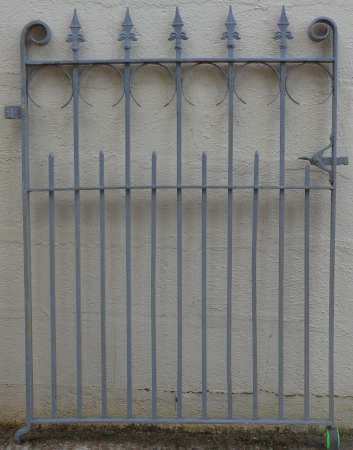 An Art Nouveau cast iron pedestrian gate with its original posts and sections of railing. 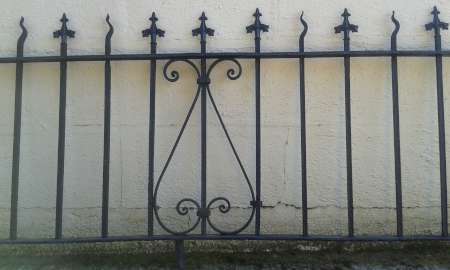 Gate – 1220mm in height x 970mm in width. Posts – 1410mm in height above ground. 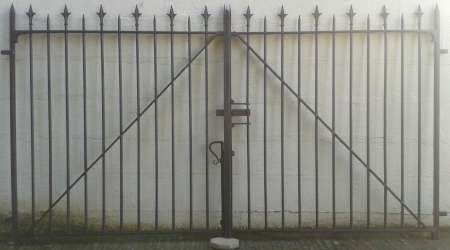 Total width of gate & posts once installed – approx. 1220mm. Railing -610mm max. height x 5125mm in total length. 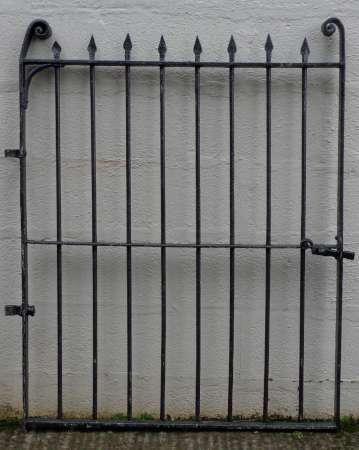 Victorian cast iron pedestrian gate with its original cast iron posts. Gate – 1220mm max. height x 910mm max. width. Posts – 1460mm in total height with 75mm to go underground x 105mm x 105mm. 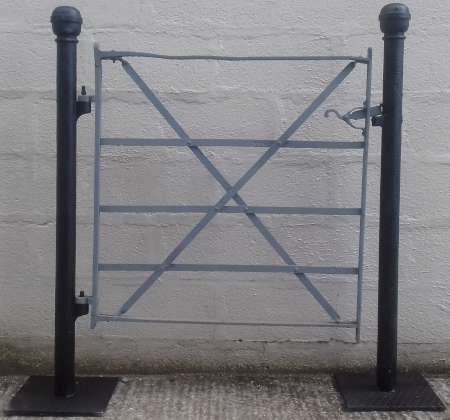 Width needed to accommodate installed gate & posts – 1125mm. 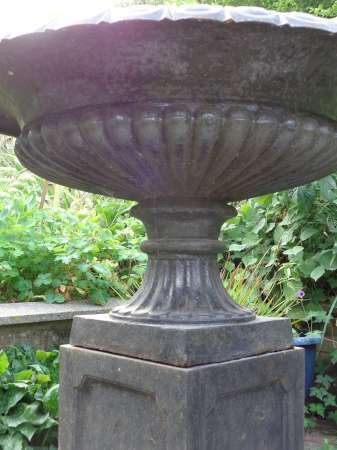 Sandblasted, primed & in great condition. 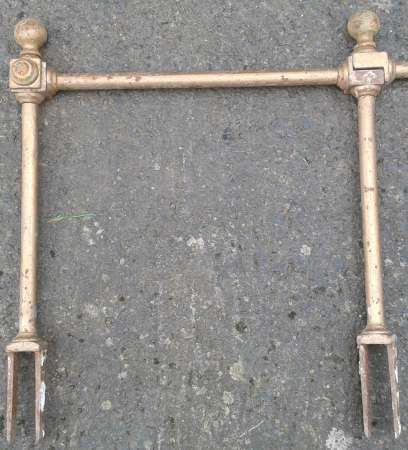 Pair of simple Victorian iron gateposts. 1485mm x 35mm x 35mm. Victorian cast iron gate posts. 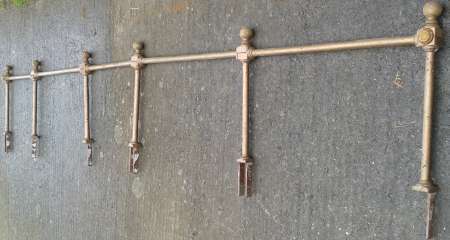 3 posts @ 59″ x 2″x 2″ – SOLD. 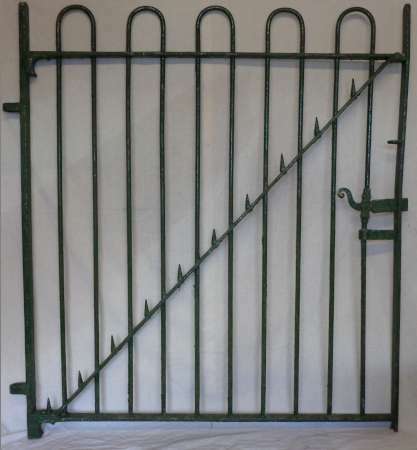 19th century wrought iron pedestrian gate. 46″ in height x 40 1/2″in width(not inc. hinges). 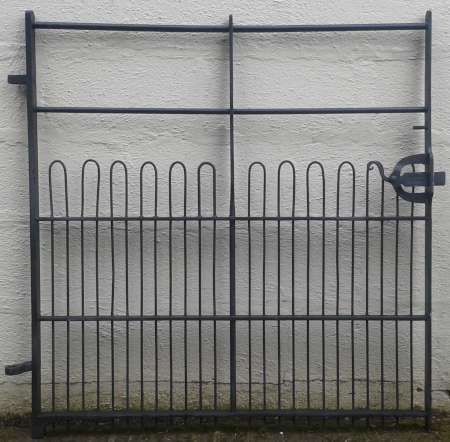 Victorian wrought iron pedestrian gate with matching railings – may split. 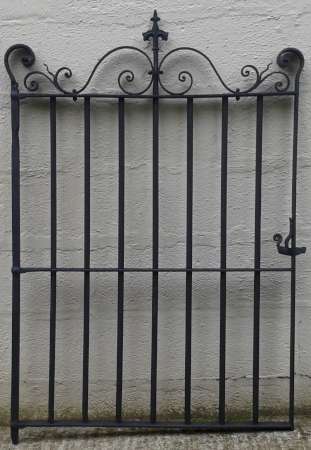 Gate – 1325mm x 903mm max. width. 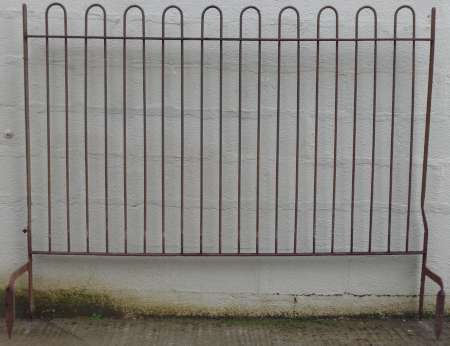 Railings – 3410mm max. length x 610mm in height. 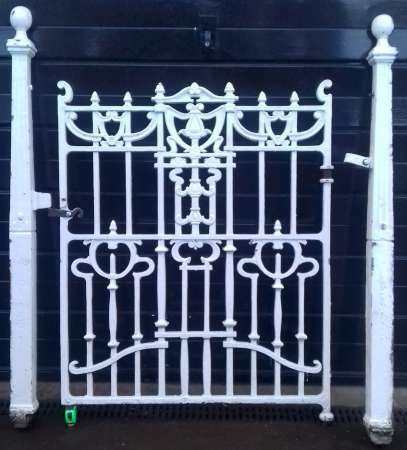 Stunning Victorian cast iron gate & railings. 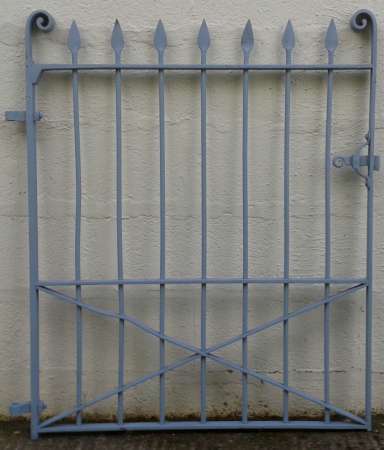 Gate – 935mm x 1355mm. 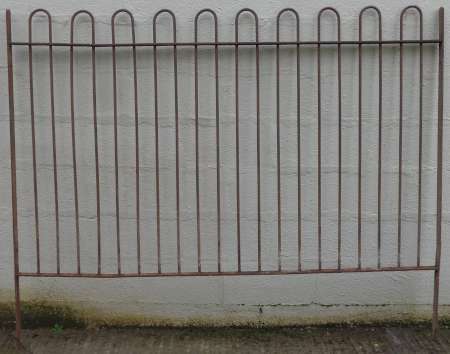 Railings – 2625mm x 529mm. 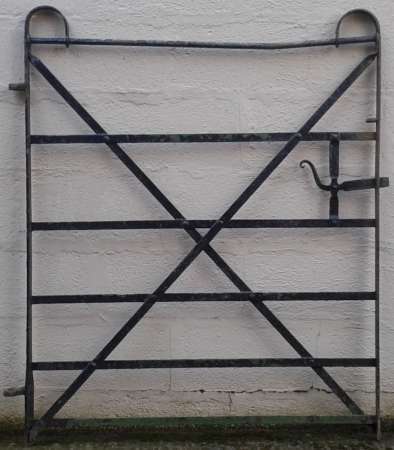 Victorian cast iron pedestrian gate with its original cast iron post – marked ” W.A.BAKER & Co. NEWPORT MON.” . 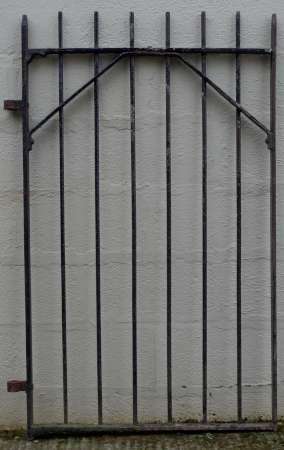 Gate – 34 1/2″ in width x 48 1/4″ in height. Post – 53 1/2″ max height ( inc. 2 1/2″ to go in ground) / 3″ square section. 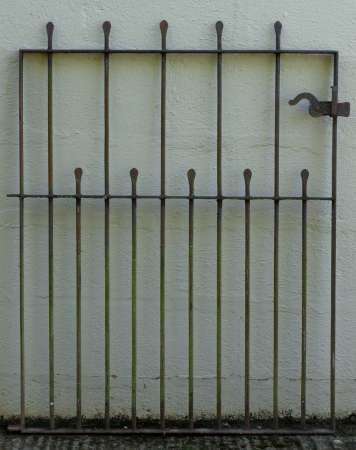 Gate & post together – 37 3/4″ in total width. 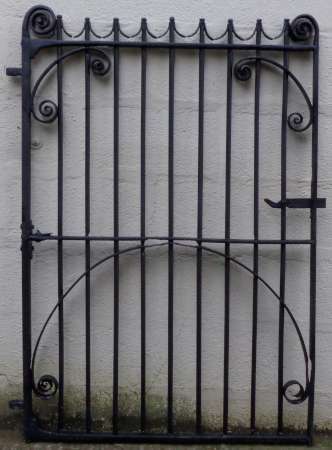 Early 19th century wrought iron pedestrian gate. 44 1/2″ high x 40 3/4″ wide not inc. hinges. 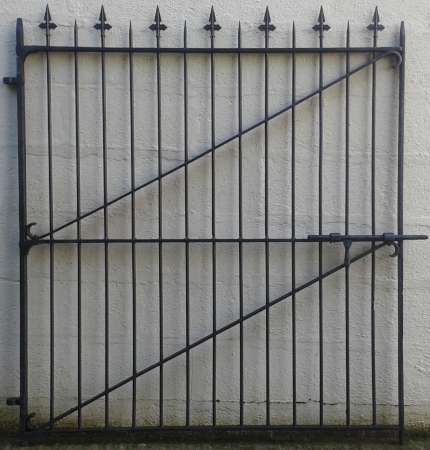 Victorian wrought iron pedestrian gate & length of matching railing. 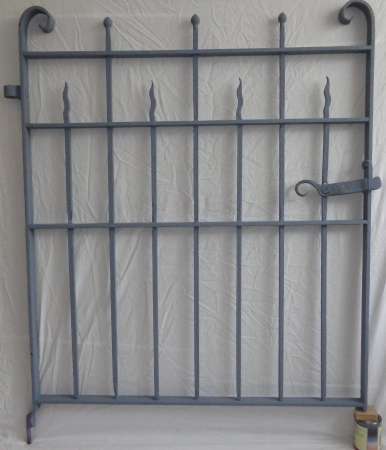 Gate – 52 1/2″ high x 36″ wide (not inc. hinges). Railing – max. 27″ in height x 141″ max. length. 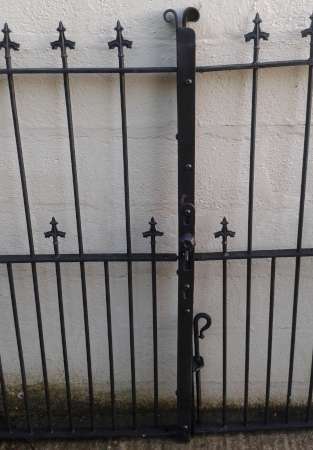 Victorian wrought iron estate gate with original cast iron posts (repaired at base & latch keep will need some adaption). Posts – 1330mm max. height x 65mm diameter. 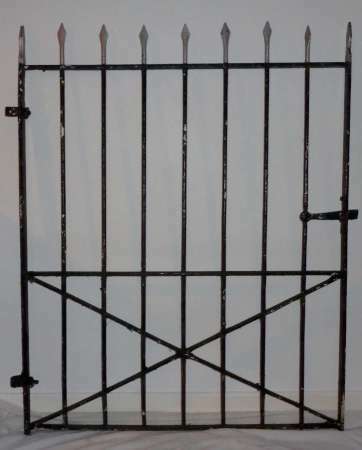 Gate – 990mm max. height x 915mm wide not inc. hinges. 33″ ( approx. 840 mm) in height . Up to 133 running feet ( approx. 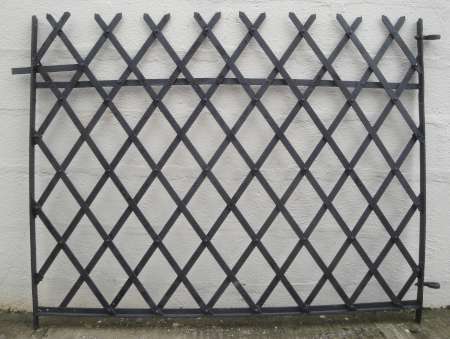 40.5 metres ) available in mostly 6 foot sections. 48 1/2″ high x 34 3/4″ wide not inc. hinges. 41 1/4″ max. height x 39″ wide not inc. hinges. 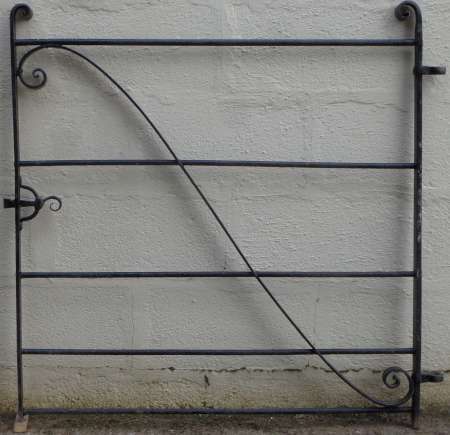 Late victorian/early edwardian wrought iron railings. Lengths of 106″ & 86.5″ remaining. Straight & in good condition. 33 1/4″ in width x 45″ in height. 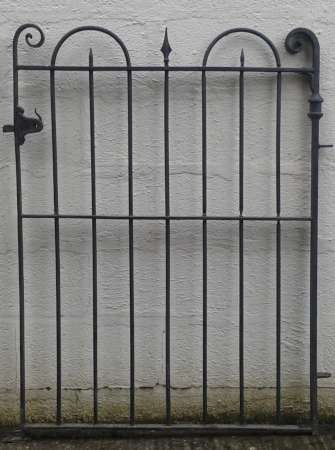 Victorian wrought iron railing – originally in between brick / stone pillars . Max. height of 460mm & 490mm x 1900mm. 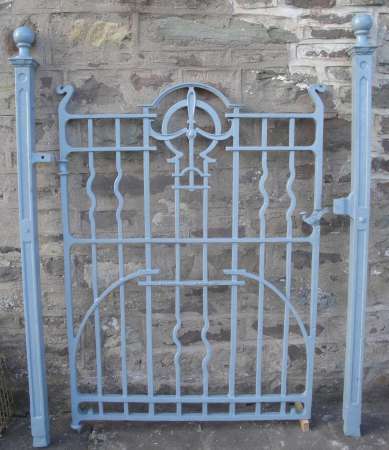 Reclaimed art nouveau cast iron gate with original posts & matching cast iron railing. 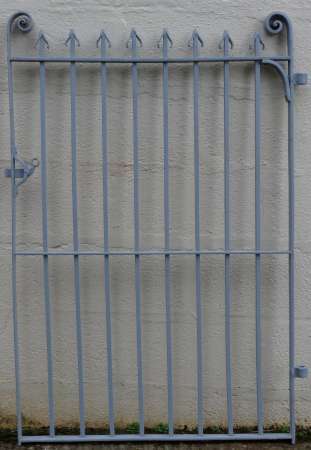 Gate – 35 3/4″ in width not inc. hinges x 50″ in height. 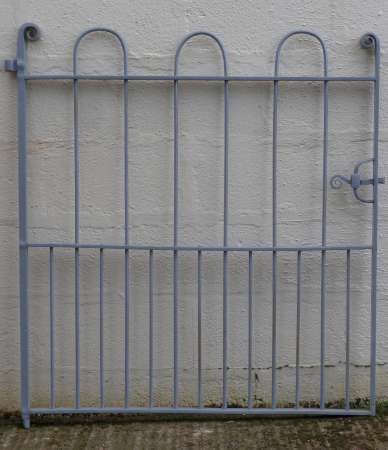 Assembled gate & posts – approx. 45″ in width. Posts – 2″ square section x 59″ (2″ to set in ground). Railing – 37 running feet x 25 1/2″ max. height. Fully restored, sandblasted & primed. 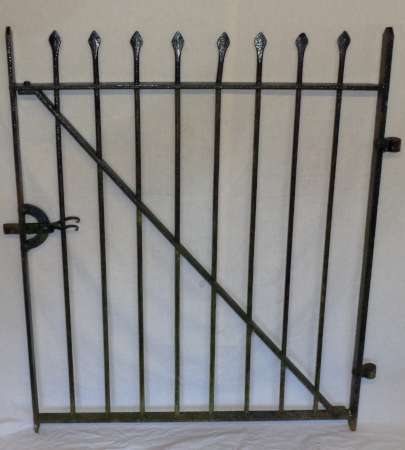 Early blacksmithmade wrought iron drive gates. 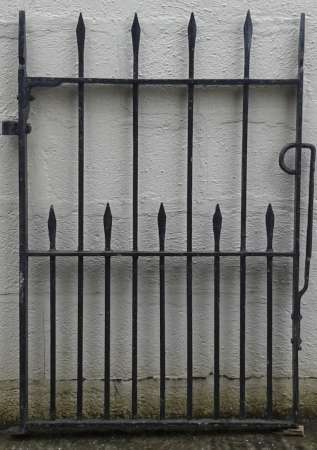 Early blacksmithmade wrought iron pedestrian gate. 59 1/4″ wide not inc. hinges x 47 3/4″ in height. 39″ wide not inc. hinges x 49″ max. height. 38″ wide inc. hinges x 53 1/2″ max. height. Height from lower horizontal bar – 1225mm. 3 panels @ approx. 1985mm + 1 @ 2130mm. 610mm wide inc. hinges x 1045mm in height. 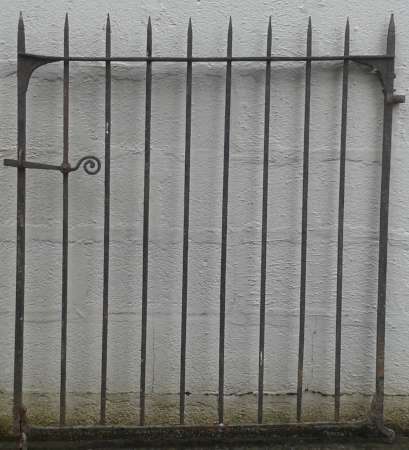 Antique wrought iron garden gate – stamped “Hill & Smith, Brierley Hill”. 1145mm in height x 1130mm in width inc. hinges. 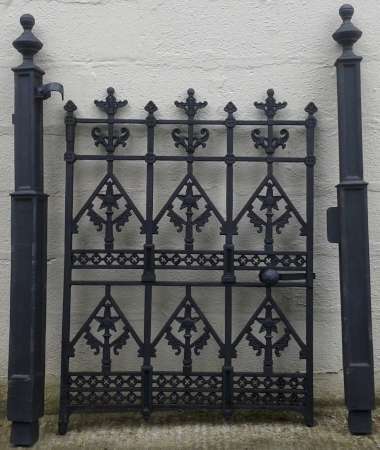 A pair of Victorian cast iron pedestrian gate posts. 1615mm in height x 70mm diameter. Bottom of top hinge pin – 375mm down from top of post. 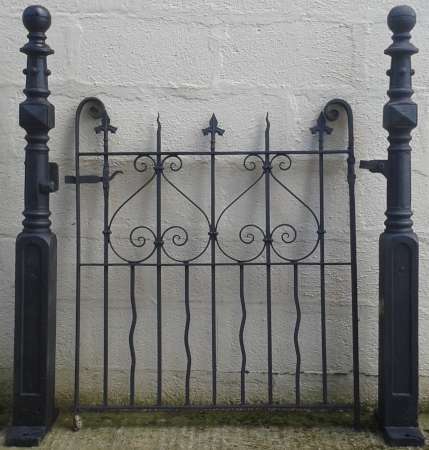 A pair of Victorian cast iron gate posts. 1625mm in height x 70mm diameter. 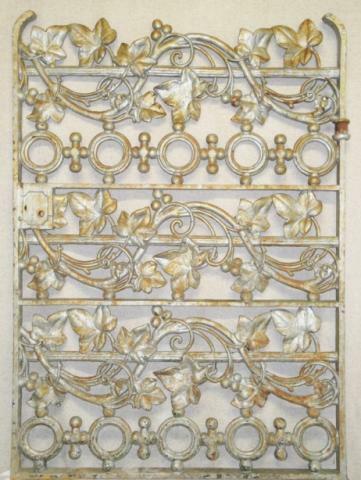 An impressive pair of wrought iron driveway entrance gates circa 1900. Reputedly originally from Pentillie Castle, Cornwall. Total width of 117″ / 2.97 metres. Max. height – 90 1/2″ / 2.30 metres. 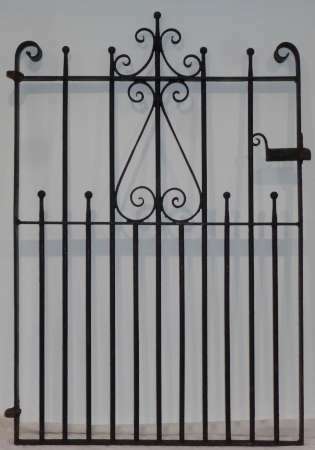 An very impressive pair of antique wrought iron driveway entrance gates. Total width of 113 1/2″ / 2.88 metres. Max. height – 91″ / 2.31 metres. 980mm wide inc. hinges x 1340mm max. height. 48 3/4″ high x 35 1/2″ wide (not in. hinges). Max. installed height – 555mm / 465mm to top of rail. Total length of 3535mm in 5 sections ( 817mm, 863mm, 620mm, 810mm & 620mm). Can be turned at 90 degrees at each upright. 45 1/4″ max. height x 34 1/2″ wide not inc. hinges. 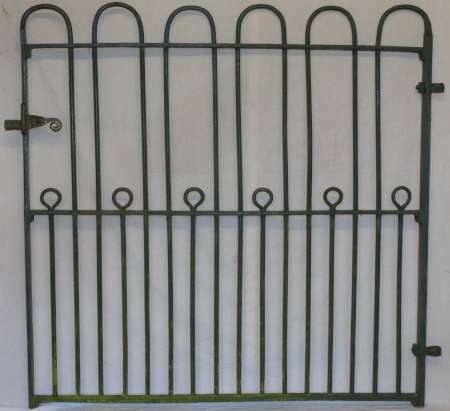 Large Victorian wrought iron pedestrian gate. 1580mm in height x 1430mm in width inc. hinges. 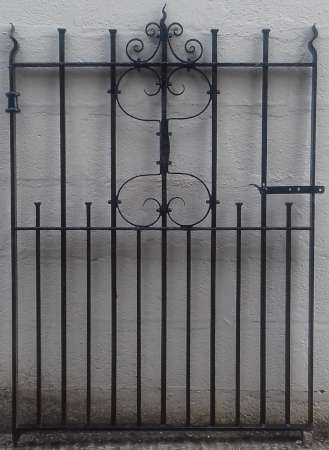 Victorian wrought iron pedestrian gate with cast iron gateposts. 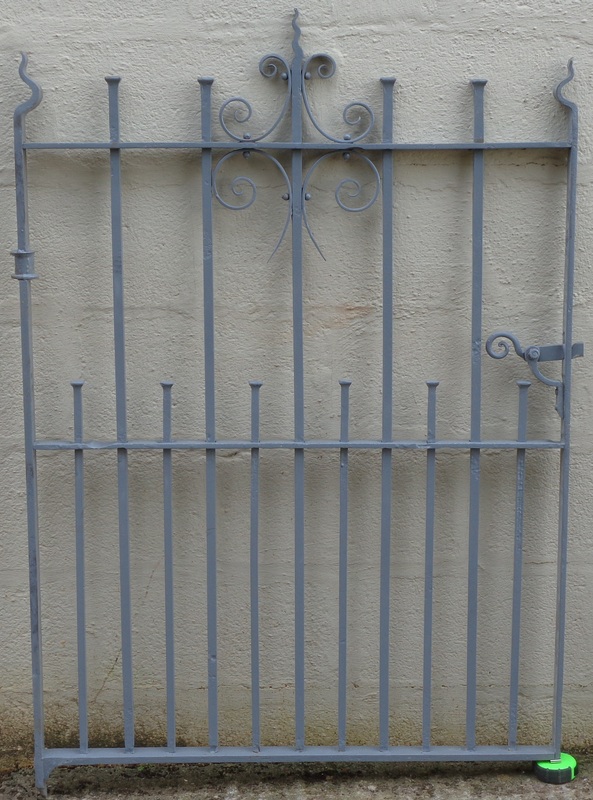 Gate – 880mm wide x 1015mm high. Posts – 1275mm in height x 100mm x 100mm square. Total width when installed approx. 1160mm. 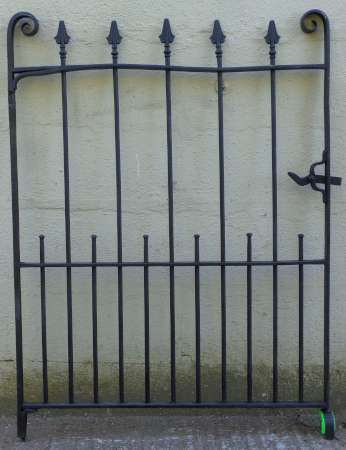 A pair of Victorian wrought iron driveway gates. 1380mm in height x 2532mm in total width inc. hinges. 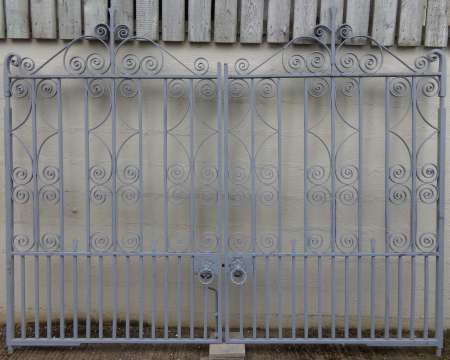 Reclaimed wrought iron garden gate. 33″ in width not inc. hinges x 56″ in height. 38 3/4″ in width not inc. hinges x 49 1/2″ in height. 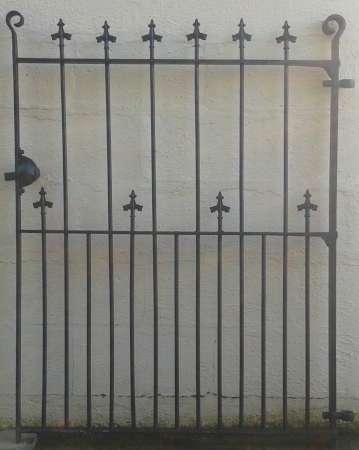 A pair of Victorian wrought iron driveway gates with matching pedestrian gate. Driveway gates – 2985 mm in total width + 100mm – 160mm adjustment on hinges x 1440mm in height. 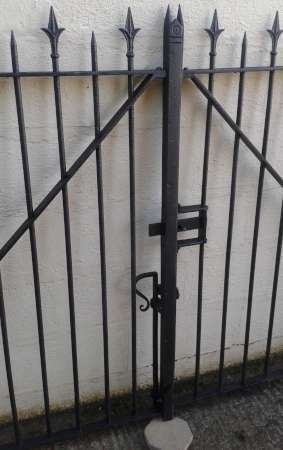 Pedestrian gate – 1010mm in width + 50mm – 75mm adjustment on hinges x 1330mm in height. 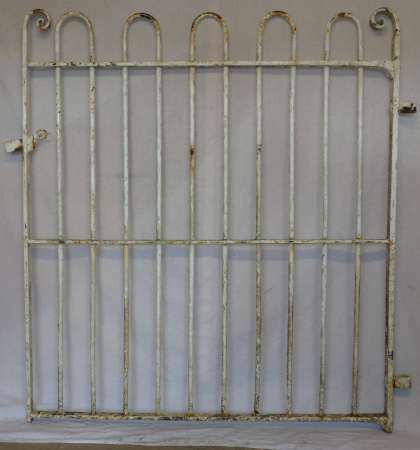 Antique wrought iron pedestrian gate. 1045mm in width including hinges x 1045mm in max. height. 32 5/8″ in width not inc. hinges x 50 1/2″ in height. 48 1/2″ x 44 1/8″ in width inc. hinges. 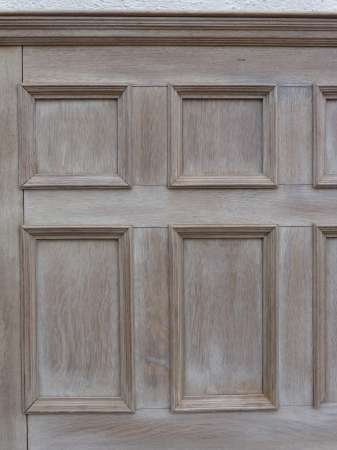 43″ x 39 3/4″ in width inc. hinges. 41 3/4″ x 35 3/4″ inc. hinges. 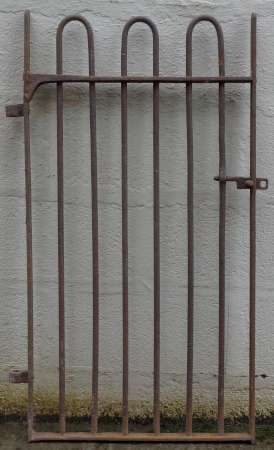 An antique wrought iron pedestrian gate. 43 1/2″ x 44 1/2″ in width inc. hinges.